Bushfires have affected Upper Beaconsfield regularly through history. This is a collection of newspaper articles describing the events. Through the names of residents mentioned we can determine the areas that were affected or were missed. On the map the fires have been drawn in, but it is impossible now to determine how wide the fire fronts would have been. UPPER BEACONSFIELD. BY TODEA AFRICANA. Flood and fire are still doing their worst, though hereabouts it is the fire fiend that still holds sway. Much sympathy is felt for Mr. Simmons, jun., of Gembrook, he lost his house and all its contents, not being able to save so much as to wrap the baby in. I did hear that steps were being taken to prove practically how very sorry the community were. Other losses in that district, though not so severe, were quite bad enough for the sufferers in these even otherwise hard enough times. We in this immediate neighborhood cannot be said to be severe sufferers, but have had to keep a sharp look out to defend our hearths and homes. I notice opposite Mr Hick's, one of the highest points of Beaconsfield, and whence one views one of the finest panoramas to be seen about here, the fire has made a clean sweep right up to the roadway. Beyond this its course was stayed, but the ardent breath of the Nebuchadnezzar's furnace has scorched the young pines on the opposite side of the way, who, like the English drummer brought before Napoleon, had never learnt to beat a retreat. I trust that having so nobly stood fire they may surive, but as the Pittosporum hedge beyond is badly singed this seems doubtful. Mrs. Cope's and other houses on Goff's road were for a time in danger, but the burly sons of Beaconsfield rallied to the rescue and eventually out-manœuvered the foe. The danger of setting fire to the bush in such a dry season as this cannot, in my opinion, be too strongly impressed upon the young and thoughtless (and the old and thoughtless, too, for the matter of that). Any more severe measures than this would, I suppose, be out of the question, as we can hardly expect the arm of the law, (which theoretically is long and strong enongh for anything), to deal with such matters as these so far away from headquarters, otherwise as a new chum in affairs of the country I was under the impression that, subject to the most fearful pains and penalties one, was forbidden from "burning off" until the month of March. This being "from information I had received," a wise provision of our paternal government, inasmuch as by that time we have generally had sufficient rain to prevent any serious danger of a juvenile Black Thursday resulting. UPPER BEACONSFIELD, Tuesday. On Sunday last Mr. J. Beatty was a heavy loser by a fire started by someone in an adjoining paddock. His sons have for upwards of two years been engaged splitting firewood, which has been drying, and was ready to cut into blocks for the coming winter's trade, and with the exception of one stack the whole has been destroyed. In addition, a large quantity of fencing was consumed. The liquidators of the Mercantile Bank, Captain H. W. Smith, Mr. H. Wardill, Mrs. R. H. Beatty, and many others have also had a lot of fencing destroyed. UPPER BEACONSFIELD, Thursday. Numerous bush fires prevailed during the excessive heat of Monday and Tuesday, Messrs Beatty losing another immense stack of firewood ready for market. Bush fires have been raging through this district for a fortnight past. Several properties here have had some narrow escapes from total destruction. In a few cases outbuildings have gone, but with the exception of some miles of fencing and the loss of some hundreds of acres of native grass, no further damage is as yet to be recorded. With Gembrook, however, the case is, unfortunately, different. The steep hills which a week or so back were covered with verdure are now reduced to a black and barren waste for miles. Mr. Geo. Martin, Gembrook West, has lost some hundreds of acres of grass and about 5 miles of fencing, Mr. Jacob Mahler has lost everything. After repeatedly saving the house, it eventually caught in such a way that he could only enter four times in an attempt to save at least a portion of his furniture. The building was insured, but this will not nearly meet his loss. Mr. Geo. Paternoster, of Pakenham, while driving here on Sunday, had his horse knocked down by a falling limb, which struck it on the head, while another branch fell harmlessly on the seat between him and another passenger. In addition to the damage reported at Gembrook yesterday, Mr. J. Sykes has been a heavy loser. On Monday, despite the efforts of several fighters, the outbuildings caught and were completely demolished. Last week bush fires throughout the district did extensive damage. There was a big blaze at Carrum, and at Scoresby Mr. O'Don had a lot of cocksfoot and rye grass destroyed. At Upper Beaconsfield the following had a lot of fencing burnt: Messrs. Renfree, Cavalier, Mahon, T. Mackley, Noble and E. a'Beckett. BEACONSFIELD, Monday. A fire which started on the Cardinia Creek gained headway on Saturday, and rapidly advanced up the Ben Eay and Fernacre gullies. The residence known as Ben Eay was in great danger for an hour, and was only saved with great difficulty. About three square miles of country were ravaged and much fencing destroyed. It is now raining. Mr Sutton Hawes, an English visitor, who had been staying for some time with with Mr Fuller, J.P., at Cardinia House, Beaconsfield, was assisting the hands to obtain control of a fire which was threatening the property on Saturday afternoon, when he was overcome by heat apoplexy. Though Dr Bennie arrived within a very short time, all his efforts were fruitless, and Mr Hawes died within an hour. Deceased was generally liked, and much sympathy is felt for his daughter, who has now no relatives in Australia. During the past few days a number of bush fires have been burning in the ranges. I have not heard of any serious damage being done (with the exception of grass and fencing), although at South Gembrook Mr. Windsor's house and orchard had very narrow ecape, the fire reaching within a few yards of the house before being checked. Beaconsfield. During the last week the bush fires have completely destroyed the beauty spots of Beaconsfield. What were once beautiful fern gullies are now masses of charred timber and ashes. Standing trees are still burning and are a great danger to travellers and tourists, numbering many, whom are visiting here this season. Beaconsfield. The recent bush fires have considerably altered the appearance of Beaconsfield. There is hardly a spot which has not been burned out. Most people have suffered in some way, losing fences, firewood or outhuildings. The efforts of the residents saved many homes that were in danger. Last Saturday a fire swept down from the hills. The strong north wind bore it into Armytage's, but it fortunately escaped the Cardinia Hotel and Mr. Cruddass'. Mrs. Armytage and Mrs Jackson lost fencing and gates, but the fire was conquered before reaching the homesteads. The park was partially burned last Christmas Eve, the day on which the Gippsland Hotel was saved by the residents, the outbuildings having caught fire. Since then Mr. Ramage inspected the bridge and park with the result that a man was sent by the council to clear the scrub. The bridge seems to be a hopeless case. The railway station presented a busy appearance on Monday evening and Tuesday morning, the holiday makers and sportsmen returning to town after their weekend trip. Game is very scarce the bush fire having frightened it all away. BERWICK.—Saturday.—Several extensive bush fires have been raging in the district, one at Harkaway proving very destructive, and spread rapidly under the influence of the strong north wind. Much damage to grass and timber and fences was done. Other destructive fires occurred at Lower Beaconsfield and Narre Warren. On Friday last a little girl, three years of age, named Isabel Gilpin, daughter of a resident of Beaconsfield, met with her death on account of severe injuries received through her clothes catching fire. The youngster was playing at a clearing-off fire in a paddock, and before her father could reach her she was badly burned, so much so that she expired in the train at Berwick while being conveyed to the Children's Hospital. A bush fire, which swept a good portion of the Beaconsfield country, broke out on Monday afternoon. Fanned by a strong wind, and fed by a luxuriant growth of grass, it spread very rapidly, and all attempts to stop its progress proved unavailing. Fortunately the damage done was not great, being confined principally to grass and fencing, but many houses had narrow escapes. Mr W. M'Lean, of Upper Beaconsfield, had his orchard badly damaged, many young trees being ruined. Amongst others who suffered were Messrs. Gilpin, Liddle, Casey, Stodart and Knox. Another fire broke out at Officer, and did considerable damage. BUSH FIRES. OUTBREAK AT BEACONSFIELD. About 1 p.m. to-day an alarming outbreak of fire occurred in the bush surrounding the residence of Dr Bevan, Pen Bryn about one mile north of Beaconsfield Upper post office. The house is a substantial one, built of brick, and is situated on the summit of a hill, and at one time the premises seemed doomed, as the efforts to beat back the flames proved futile. However, after two hours of hard work, the efforts of Mr. Hurditch, assisted by a willing band of his employes and friends, had the effect of diverting the flames past the paddocks, and thus saved the premises. The wind veered round, and the flames pursued their course on towards Sugar Loaf Hill, which was the centre of the extensive fires which ranged here about three weeks ago. Pakenham. Several bad bush fires were raging out towards the Beaconsfield ranges last Saturday. UPPER BEACONSFIELD, Monday. The first outbreak of fire in this district this season occurred on Friday night. Salisbury Gully, which runs behind Salisbury House, and the post office caught fire. The residents around rushed to the spot, and endeavored to check its progress. The wind veered round to the west, and lulled down, saving the destruction of the post office. On Saturday afternoon, fanned by a north west wind, it broke out afresh, immediately in the rear of the post office, destroying all in its path. Again willing hands set to work, and ultimately succeeded in their efforts. On the east side of the gully the Rev. Jas. Wilson suffered through the flames destroying his stable and outhouses. No such serious an outbreak has occurred here for years, and its being in the very centre of the township caused much concern. A fire, which caused a good deal of alarm, broke out in Salisbury Gully, Upper Beaconsfield, on Saturday afternoon last. The first outbreak was at the rear of the new post office and in close proximity to Salisbury House, and these places as well others were saved only by the strenuous exertions of the many willing fire fighters. Mr Hopkins was the first to give the alarm, and the men at work at the post office, Mr Lee, Mr Hopkins, Mr Barnett and others were soon battling with the flames. Fortunately the wind changed towards evening and by 8 o'clock all danger was practically over. The Rev J. Wilson had part of his orchard damaged by the fire. During the past few days there have been some large bush fires burning around Pakenham, and a good deal of damage has been done to grass and fencing. UPPER BEACONSFIELD. During the past week we have had some very hot and trying weather and bush fires have been very prevalent. At one time no matter in what direction one looked a fire was burning. A considerable amount of damage to fencing was done, and on Tuesday a five-roomed weather board house on the Gembrook road was completely destroyed despite the efforts made by a neighbor to save it. The house was owned by Mr Wilson, whose loss is, I believe, covered to a certain extent by insurance. The long spell of dry weather has made its effects felt on the domestic water supply, and many householders are complaining of a scarcity of water. Jottings from My Note Book. BY PHILOS. The destruction by fire of Salisbury Gully last week is a distinct loss to Upper Beaconsfield. The gully was the beauty spot of the place, and visitors never failed to find time to wander through the glades of handsome ferns and other bush foliage. The gully, although, of course, the handiwork of Nature, was first improved by the late Mr Geordie Craig, and of late years had been brought almost to perfection. Fernland has, of course, no bright flowers to show us, yet there is no class of plant that gives us more continuous pleasure. A long list of other plants that produce brilliant flowers delight us only during their blooming season. At other times they cannot be said to be attractive. But ferns are always beautiful, and in a condttion to give us lovely fronds to brighten the charms of the flowers that are in bloom. It will be a long time before the famous gully herein named will assume what for years has been its normal aspect. BUSH FIRES. THE BEACONSFIELD HILLS. WOMEN FIRE-FIGHTERS. While the fire-fighters were busy at Fassifern another outbreak occurred two miles further east. This fire began in some dense forest country lying between the properties of Mr W G L Spowers, Mrs Anderson and Mr John Knox. The northerly wind took the fire along the range at a great pace. There were fears that it might run down into the Tumuc Valley, towards Pakenham, where there is one of the largest and most prosperous apple orchards in the state. However, with the setting sun the breeze dropped and, though the fire burned fiercely in the dry timber and undergrowth, it did not spread. During the onrush of the flames on Wednesday afternoon and evening, Mr and Mrs Austin, acting as caretakers for Mr J. Knox, who with his wife and family are in Tasmania, were deeply concerned for the safety of the homestead. On Thursday, while Mr Austin was down in the gully trying to turn back the flames the homestead was again threathened. The fire took a hedge of blackberry briars in its stride, and tore through the orchard as though nothing would stop it. Mr Austin checked it at one corner of the orchard with buckets of water, but it broke through at another point. Mrs Austin, single-handed, was fighting hard but seemed powerless. Just at this stage, however, Miss Christy, a lady gardener, who had arrived to do some pruning work came on the scene. By this time the fire was within 20ft of the house. It had already caught an outbuilding, over which were some dry honeysuckle and other creepers; but the two women got the hose to work, and the water beat the fire. Then other help arrived and, as if a reward for the plucky women who had done their work so well, the wind changed and the fire turning away up the gully, the homestead was saved. In the account published on Saturday of the bush fires on the Beaconsfield Hills it was stated that the fire swept up the hill along the side of Mr. A. V. Kirkwood's orchard. Mr. Kirkwood states that the nearest the fire was to his orchard was 517ft. and it was 650ft. from his residence. Mr. Kirkwood has no bush within 300ft. at the nearest to the house or outbuildings, and regards himself as perfectly safe from fire. A fire which started in the Emerald district and spread through much of the rough country between there and Upper Beaconsfield was travelling towards Berwick on Thursday morning last. It was burning fiercely and large volumes of smoke were rising over the Harkaway hills. About midday word was sent to Berwick the fire was within half-a-mile of Mr Newport's place, and there was danger of it spreading on to the property. Constable Lombard went to the scene of the fire and with other residents of the locality was able to confine the burning to a rough patch near the creek. The fire was burning briskly in the evening, but fortunately it was extinguished by the rain which commenced to fall early on Friday morning. Although the fire had been burning for over a week, and had travelled through miles of country, but little damage was done. There have been serious bush fires around the Beaconsfield hills in the past week. Thursday was spent by the residents in fire-fighting. All properties were saved, except the store kept by Messrs Krüss and Stickland, which was burnt to the ground early yesterday morning. During Thursday, of last week, the township of Beaconsfield was surrounded by bush fires, but, through the energy displayed by local residents, in beating out the flames, none of the dwelling houses were destroyed by fire. However, on Friday morning the flames burst forth once more, and the store of Mr Krüss caught fire, and was totally destroyed, notwithstanding the efforts put forward by many willing helpers. Bush fires, which had been raging near Monbulk, Olinda, and between Ferntree Gully and Bayswater, for the past couple of week, were extinguished by th welcome rains which fell during Thursday and Friday. The fires, however, destroyed large tracts of timber, and a large quantity of fencing. BEACONSFIELD, Tuesday. - Bush fires were raging on the Beaconsfield Ranges on Monday and firefighters were kept busy. Gilolo, a property known also as The Marshes, was burnt. Nobody was living in the house. Dr Day's house at the top of the Telegraph road, which is nearing completion, was saved with difficulty on account of the dense scrub surrounding the building. A small cottage adjoining, owned by the Misses Salter, was destroyed before the beaters could prevent it. Only the tanks have been left standing. The gully at the back of Windara was burned out. The fire swept through the orchard, but "breaks" were burned, and the flames were beaten back after a stern fight. Flames surrounded Casely and upon their return from Berwick the minister (the Rev. J Wilson) and his wife found a number of neighbours fighting the fire. Fire breaks were made, and with the change of wind at half past 8 o'clock last night old dead trees cast showers of sparks which ignited the pigsty. Although the sty was burnt and the house and stables threatened, the fire was controlled. Bush fires broke out again in the Beaconsfield Ranges on Wednesday in the gully near McLean's property. The fire quickly travelled into Mr. McBride's property, Linwood, and the gully near Kyogle. The cleared spaces around this property assisted the firefighters, who burnt a break past Kyogle and Alston as far as the deep gully. This the fire crossed, and burned fiercely towards Woondia Mia and Fern Acre. Towards evening it died down. During the night 67 points of rain fell, accompanied by a thunder-storm, and extinguished the fire. Extensive damage was done on Saturday and Sunday by a fire which swept the hills around Beaconsfield Upper, denuding them in parts of trees and foliage. No houses were burnt, but severe damage was caused to orchards, fencing and the out buildings. Commencing early on Saturday morning, the fire rapidly extended, and by Sunday morning eight houses were in danger. The fire-fighters then numbered 150, having been drawn from Beaconsfield. Beaconsfield Upper and Berwick. A fire break one mile long was burned but despite the break the fire obtained a hold in a week end cottage near the township, and the firefighters had to burst open the doors to quell the flames. Many outbuildings of houses in the fire zone were burnt, but the strenuous efforts of the fighters saved the houses. The fire had such a strong hold around the property of Mr W G L Spowers at Upper Beaconsfield that hope of saving the house was abandoned, and the furniture was removed to a place of safety. The flames, however, were extinguished at this spot after only the verandahs and outbuildings had been burnt. Late on Sunday afternoon the fire was burning strongly on a frontage of about two miles, while Beaconsfield and Berwick district were overhung by a thick pall of smoke. The fire was still burning last night. AT BEACONSFIELD. Orchard, Outbuildings and Fences Burnt. Flames Menace Houses. BEACONSFIELD, Sunday.—Yesterday afternoon an extensive fire, which at one time threatened Tumuc Valley, broke out again and swept towards Upper Bencons field with increasing activity. Early in the afternoon Mr. C. A. Berglund's orchard and home were the first to be endangered, and only by the strenuous exertions of willing workers was the house saved, the fire actually reaching within a few feet of the house before the fire fighters succeeded in checking its pro gress. Portions of the orchard and some fences and outbuildings were destroyed. Efforts were then concentrated on Mr. W. H. Spowers's property, and for over an hour it seemed impossible to save the home, the destruction of which at this time might also have involved the burning of Mr. E. Hamilton's house, which is every close to it. A hasty fire break was made, and fortunately there was a drop in the wind, these factors largely contributing to the saving of both properties. By 10 o'clock last, night the fire fighters had the outbreaks under control for the night. This morning the smouldering fires were pulled into life again by a light wind. The revival was around Mr. Spowers's home, and despite the energetic efforts of the volunteers all the outbuildings were entirely consumed. The house is constructed of brick, which saved it from destruction. As it was, a considerable portion of the wood work was damaged by the flames. So serious did the situation become at one stage that the doors were burst open and most of the furniture removed. This afternoon urgent calls for help were received from Upper Beaconsfield. The change of wind had driven the fires up the gully on the south leading to the homes of Mrs. Drake, Mrs. Goff, Messrs Robinson, Campbell, Deville, Wintle, Ellis, Harvey-Smith J. P., Brown and Dr. Lind. Within half an hour over 150 helpers, including many Melbourne visitors, reached the danger zone from all parts of the surrounding districts. Under Constable De la Rue, of Berwick, the volunteers concentrated on making fire breaks. Even then some of the buildings had remarkably narrow escapes. Near "Runnymede," the fire jumped the road and set alight to a gum tree, 40 feet high. The sparks from this set alight to a pine tree near the house. Mr. Geoff. Grant climbed the tree and broke off the blazing limbs, which removed a great source of danger to the house. The new church was only saved by making a wide fire break right from the main road, and for a time the advancing fire was a blazing inferno for a quarter of a mile at the rear of the church and several homes which stand on top of the gully. At 9 o'clock to-night the burning gully was an impressive sight. Though the danger point was probably passed a close watch is being kept, right through the night, especially at Mrs. Keebles's, where the limb of a large gum tree alongside the house is well alight. The land near Cardinia Creek is ablaze in several parts, and it is possible this fire may junction with that in the gully to the north-east, where a change of wind may bring further trouble. BEACONSFIELD THREATENED. Telephone Lines Down. BEACONSFIELD, Sunday.—Never in the history of Beaconsfield has such a series of fires occurred as was the case to-day. With a fierce northerly wind blowing, the first fire started in the north end of the Cardinia Park, and, with flames that swept towards Lower Benconsfield, crossed the road into Grant's and Bates's grass paddocks, extending into Miss Armytage's property. Helpers arrived from all quarters, and after a fierce fight they succeeded to some extent in obtaining control. The vagaries of the wind started the fire in other directious, and for a time, the township itself was threatened. Under the command of Constable Delarue, from Berwick, fresh onslaughts were made, and the fire was diverted from the bridge and hotel at Beaconsfield. All passing cars were commandered for moving fire-fighters. Just about the time when things were made safe urgent messengers from Upper Beaconsfield came for help, and car loads of fire-fighters were soon on their wny to the scene of disastrous fires in the ranges. The telephone was useless, as many of the poles were burnt and communications interrupted. At Upper Beaconsfield a formidable task confronted the helpers, and for a time the township was menaced. As it was, the residence of Mr. Robinson was utterly destroyed, the only thing saved being a car. The loss is estimated at £1000. At Rev. James Wilson's, the sheds, stables and buggy were destroyed and the house caught alight five times. Salisbury House was only saved by a miracle, the wind dropping long enough to make a break. Mrs. Goff lost a mile of fencing and 150 fruit trees. Further fires were visible, but no details are to hand. The Salisbury Gully got well alight and was swiftly swept in a south-eastern direction, menacing the homes of Messrs. Dixon, Paget, Praill, Ferguson and others. In a quarter of an hour the whole range near the reservoir was a blazing inferno. The spectacle from a distance was magnificent, tongues of flame leaping fully 100 feet high into immense clouds of black smoke, which quickly travelled towards Officer. Owing to the disablement of the telephone wires no further details are obtainable. The Dandenong fire brigade came in three cars and did valuable work at both fires. Calls for assistance were made in the morning in connection with fires near Mr. Osborne's property. Great damage was done in the Healesville, Yarra Glen, Wonga Park, Croydon, Lilydale. Warburton, Bunyip, Bairnsdale, Beaconsfield, Salisbury Gully, Emerald, Darlington, Toora, Sale, Foster, Moe, Upper Fern Tree Gully, Ballarat, Hamilton, Torquay, Belgrave, Nathura Springs, Lorne, Cowes, French Island, Edithvale, Killara, Yarra Junction district. 1,000 FIGHTERS AT WORK. SEVERAL HOMES DESTROYED. GIPPSLAND TOWNSHIPS IN PERIL. BERWICK Sunday.—The worst bush fires ever experienced in the district swept over many thousands of acres today following upon almost simultaneous outbreaks at Narre Warren North, Beaconsfield, Upper Beaconsfield, Harkaway, Sweet Hills and old Narre Warren. More than 1,000 men from Dandenong and the surrounding districts were engaged in fighting the flames but so wide was the front of the fire and so rapid the onrush of the flames that six houses, together with all the contents, were destroyed. The fire swept into the township of Beaconsfield, and the Central Hotel became ignited. Scores of volunteers rushed to the burning building, and after strenuous efforts for three hours the flames were extinguished. Later in the day a serious outbreak spread rapidly in the Officer district, and a large body of men was rushed to the scene. Ten houses were threatened and all the contents were hurriedly removed to clearings in the bush. An alarm was received from Narre Warren North in the morning that another outbreak had developed on Mr Oram's property, and was burning through the farm of Mr Bailey in a southerly direction. So fierce was the onrush of the flames that soon after it began the dwelling of Mr H Moore, farmer, of Narre Warren North was destroyed with its contents. Mr James Godwin, an old age pensioner, lost his house and all his possessions in the flames. The dwellings of Mr Courtney and Mr Andrews were destroyed before anything could be saved. The houses of Mr Kennedy and Mr Battersby at Narre Warren North were saved, although all sheds and numerous haystacks and outhouses were burned. At Upper Beaconsfield where serious fires had been subdued last Monday, a fresh fire occurred, and extending over a wide front before it could be confined, it had swept the property of Mr Burgess Robertson [Fergus Robinson] and destroyed his house and the farm buildings. Residents of this district were seriously handicapped, as no assistance could be given from the neighbouring centres. Miles of fencing has been destroyed, and main telegraph poles are down. Fanned by the strong northerly wind, the flames are still extending easterly, and many homesteads are in great danger of destruction. Many holdings have been denuded of grass and in many cases homes were saved only after long fights against fires which burnt garden fences and in several cases verandah posts. At 11 o'clock, to-night the hills for miles around were ablaze and fires were advancing rapidly towards the town of Pakenham which is in great danger of complete destruction. Hundreds of orchards have been destroyed in the closely settled districts between Beaconsfield and Upper Beaconsfield. The property of Mrs Mann was burnt right out and the house burnt to the ground. A fierce fire is burning along the Cardinia Creek, and homesteads along the banks are in danger. The strong northerly wind showed no signs of abatement. Between Berwick and Upper Beaconsfield a fire burnt down from the hills and menaced the homestead of Mr. H. Gould, who was entertaining a party of cricketers from the Junior Cricket Association. The match was abandoned, and the players spent the afternoon and evening in fighting the flames. The fire-fighters were under the control of Constable De La Rue, who despatched parties of men in motor-cars where urgently needed. DESTRUCTION OF TREES ON ROADS. Sir,-The wilful destruction of trees upon country road has lately been commented upon by several correspondents, and not without good reason. Property owners in the country have a bad habit of cutting out all or most of the trees on adjacient roads. Sometimes they have the shire council's permission, often they have not. The wood is carted away, and all the rubbish is left upon the ground, where it is a certain menace for bush fires. It is a matter for great regret that the picturesque beauty of many of our mountain roads has been ruined by the acts of thoughtless people. Shire councils should see that men do not remove unnecessary timber when cutting fire breaks. There is little doubt that many bush fires have been started among the rubbish on the roads by careless travellers. If the Forestry department had sent out competent rangers through all the timber country to see that proper fire breaks were cut, we should not have experienced these horrible fires.—Yours, &c., MURRAY. While the fires ravaged some parts of the district, the following beautyspots are unharmed:—Stony Creek, Bateman's Falls, Bourke's Creek, and Cardinia Creek, above Upper Beaconsfield. All these places can be reached by car, and although the fires have been around the Reservoir and Toomuc Valley, these places are always, worth visiting. UPPER BEACONSFIELD, Friday. - Although bush fires have passed through certain gullies, the general surroundings and the scenery of the district have not suffered to any appreciable silent. None of the guest houses has suffered any damage from fire. BEACONSFIELD, Tuesday. — Temperatures were very high to-day. During the morning a bush fire broke out on Mount Misery. One house was saved from destruction only by great efforts by those who rallied to the call for help. What looked like a serious outbreak was overcome. A volunteer bush fire brigade has been formed. Mr. J. M. Reed, chairman of the Tourist Committee, who convened the meeting, announced that he had been in communication with the Forests Commission, and, as a result, had received an issue from it of beaters, water bags, and rakes. BEACONSFIELD, Tuesday. — In order to reduce the risks of bush fires as far as possible, a bushfire brigade has been organised in Upper Beaconsfield. A ready response was made to the call for membership, and responsible men have been appointed in various parts of the district to report immediately and take action to check outbreaks before they have a chance of assuming dangerous proportions. As all members will act in an honorary capacity, a local fund has been started for the purchase of equipment, and local property owners and visitors are giving donations. The formation of, the brigade was not commenced too soon. The first bush fire in Beaconsfield district occurred this afternoon. Volunteers from Berwick joined forces with the local residents, and until late in the evening they were kept busy quelling the outbreak, which at one time looked serious. Commencing at the rear of McLean's property the fire crept toward the gully leading to Salisbury House, but with a change of wind it turned west, and jumped the road into Mr. Haynes's orchard, where slight damage was done to outbuildings. There are several weekend cottages in the vicinity and efforts were concentrated upon, minimising posible dangers through any further change of wind. A bush fire occurred at Beaconsfield on Tuesday afternoon, starting on Mr. McLean’s property and continuing towards Salisbury House. The newly-formed Beaconsfield Fire Brigade, with the assistance of volunteers from Berwick, was kept busy until late in the evening. At one time the outbreak, looked very serious, but was eventually got under. A change of wind occurred at a gully near Salisbury House, and the fire turned towards the west, crossing the road into Mr. Haynes' orchard, where some damages was done to outbuildings. Several week-end cottages are in the locality, but the efforts to prevent the flames reaching them were successful. A local fund has been established to purchase equipment for the Beaconsfield Bush Fire Brigade, and residents are subscribing freely. A bush fire broke out near the main Upper Beaconsfield road on Thursday afternoon. Members of the Berwick and Beaconsfield Bush Fire Brigade, with several other district residents and fire equipment, were quickly on the scene, and the outbreak was eventually got under control. There was a very strong wind, and at one time the fire seemed likely to be serious, but desperate fighting kept it confined to scrub country. About 50 acres of country and a little fencing were burnt, but the destruction was chiefly amongst thick, worthless scrub. Miss McLean's house at Upper Beaconsfield had a narrow escape from the flames, but was saved after a little damage had been done to the orchard. The fire, though well under control, continued to burn till late. In the evening, Beaconsfield residents remaining, to guard against any further outbreak. Another fire occurred at the back of Harkaway the same afternoon, but owing to the rough country and thick scrub, no one could get near it, and a number of watchers stayed in the locality to the flames extending into the cleared area. At the annual meeting of the bush fire brigade the following officers were elected for the ensuing year:—Captain, Mr. Ulick a'Beckett; vice-captain, Mr. Colles; secretary, Mr. Ken Hudson; district officers, Messrs. Vincent, McBride, Luke, Hamilton, Hurditch, U. a'Beckett, Howell, Kerr, Love, Brown, Wintle, and Colles. It was decided to burn off the scrub round the Church of England at the first suitable opportunity. Other danger spots will be made safe as opportunity offers. The annual meeting of the Bushfire Brigade was held in the hall on Thursday night, when there was a fair attendance. It was thought that the coming season would prove a bad one for bush fires, the wet Autumn and Winter had caused such a growth of scrub and grass, that if we got a hot, dry Summer fires will be plentiful. A letter was received from Lieut.-Col. Campbell offering to supply a motor truck fitted with two forty gallon water tanks whenever the brigade required it. This offer was accepted with thanks. The election of office bearers resulted as follows: Captain, Mr. U. a'Beckett; vice-captain, Mr. C. Colles; secretary and treasurer, Mr. Ken Hudson; district officers, Messrs. Hurditch, a'Beckett, Baxter, Brown, McBride, Colles, McArthur and Webster. The parts of the ranges most affected were Beaconsfield and Montrose. At Beaconsfield the fires are still raging. About 500 people were out yesterday fighting the flames. They came from as far as Pakenham and Dandenong in cars and trucks. A five-roomed house at Beaconsfield, owned by Mr Harkness, was burned down on Saturday, and yesterday a property at North Beaconsfield, owned by Mr J. Lang, was destroyed. Each property was valued at about £400, including furniture. One of the biggest saves made in the Dandenong Ranges during the week end was of Mr W. Berglund's fine property at North Beaconsfield. The fire swept through a gully and attacked the property fiercely. More than 40 volunteer fighters were working at it for some hours yesterday afternoon before they succeeded in beating it back. A fire is still burning about Mr Love's property at Upper Beaconsfield. At present it is safe. The only fear is that the wind will rise and again fan the blaze. The fire had to be fought over a 10-mile front on Saturday and yesterday. It was most fierce from Beaconsfield to Upper Beaconsfield. At times there were 1000 people beating it. Motor trucks fitted with hand pumps helped them. There was a plentiful supply of water. The water holes are now getting low. A WALL OF FLAME. FIGHT TO SAVE HOMES. Thrilling Fire-Fighting Episodes. BEACONSFIELD, Sunday.— The most thrilling fire-fighting episodes for many years occurred around Beaconsfield Upper during Friday, and Saturday; and for a time it looked as if the whole district would be wiped out. On Friday about fifty local people had all they could do to save the residence and outbuildings of Mr. McMillan, and after the fire had jumped the main road, it was found necessary to burn a wide break to stop any further advance on the threatened home of the Misses McLean. On Saturday morning another fire commenced on the eastern side of the road, and only the strenuous efforts of many willing workers saved from destruction the homes of Messrs. Baker, Blair, Traughton, Gilpin and Buckleigh, but the choppy north wind made it impossihle to save McMillan's fine orchard of lemons and mixed fruits, about 8 acres of which were completely destroyed. On the adjacent property of Mr. Harkins an unoccupied house and sheds went up in a whirlwind of flames 30 feet high. In the afternoon a sudden change of wind from the south called for desperate efforts to check the menace to Beaconsfield Upper, and urgent calls for assistance were made on Berwick and Dandenong. Berwick bush brigade, under Constable Barrett, rushed over with a full equipment, and soon proved the value of such organisations. In a short while fully 250 volunteers determinedly fought to save the homes of Messrs. McBride, McDonald, Wright, Lockie and Campbell, who lost many valuable shrubs and flowers worth hundreds of pounds. "Kyogle" was surrounded by a wall of fire, and a party of 25 fire fighters narrowly escaped being trapped in a sudden swirl of flame that swept up with great velocity. The house was saved by a miracle. Miss Elliot's house caught fire in the roof, and the ridging had to be torn off to extinguish the outbreak. The properties of Messrs. J. C. Campbell, de Ville, Harvey Smith, Binding, Robinson and others were all on the danger list; as well as the Church of England, but the army of helpers won out, and by evening the outbreak was well under control. Hastily removed furniture, &c., was thankfully replaced in the many endangered homes. This afternoon a strong easterly wind set in, which developed an outbreak in Salisbury House Gully, but prompt attention kept it well under control. Large parties of helpers were rushed to cope with serious fires around the properties of Mr. Berglund, overlooking the Toomuc Valley, and Mr. Binding on the western side of the range, and it was only by the most energetic measures that serious disaster was avoided. DAMAGE AT BEACONSFIELD. 200 Beaters Fight to Save Houses. BEACONSFIELD UPPER Monday - One of the largest fires the district has known occurred on Friday and Saturday, when a strong wind fanned fires that had been burning in the gullies, and they swept through the thick scrub. One fire threatened Mr McMillan's house and the apple and lemon orchard around the house was seriously damaged. On the Officer road, east of the township, a fire burned around the property of Mr Cordner, and destroyed a summerhouse. On Saturday the wind blew with greater force, and the fire, which had damaged Mr McMillan's property, raged the gully toward the houses on St Georges road on top of the ridge. All the assistance available was called out and it was only through the untiring efforts of the fire-fighters assisted by the Berwick and Dandenong fire brigades that the position was made safe by evening. Three beaters had a strenuous fight to save Mr Cordner's buildings, and immediately afterwards Kyogle, which is built on one of the upper spurs leading to the ridge along which St George's road runs was threatened. The beaters had eventually to leave the house to the fire, which burnt up to it, but did not set it on fire. By this time 200 men were fighting the fires. The postmistress tendered invaluable help keeping all parts of the district in touch with developments. The efforts of the fire-fighters on Saturday were successful in saving the houses on the west side of the township but the fire was not extinguished. It continued to burn up the gullies farther to the west. The wind increased on Sunday morning, and blew the flames to the north. Danger was threatened at the back of Mrs Keeble's and Mrs Goff's houses, but there were enough volunteers to prevent any damage. In the early afternoon some of the properties on the old Harkaway road were threatened, and a party of fighters went out to them. By early evening they had saved the situation. On the east side of the township the house occupied by Mr Savory and one owned by Mr Berglund were in danger. The wind had changed to the east, and an urgent message was sent for assistance, as the flames were travelling rapidly up the hill toward the properties. Helpers were sent by car, and after a strenuous fight they saved the houses and outbuildings, although some of the beautiful hedges and the garden of Mr Berglund's property were much burned. The flames were subdued until this after noon, when a fresh outbreak occurred at the bottom of Judge Bevan's property and threatened to destroy Mrs Wheeler's house. A large number of helpers got the fire under control, and then they left hurriedly to burn a break against a fire which was burning up the steep gully below Judge Bevan's house. The whole of the hills from the Beaconsfield road to the top of the ridge have been swept. Thousands of acres have been burnt on the east side of the township. BEACONSFIELD UPPER -In the absence of the owner a fire reached the property of Mr Appleby and burnt a shed in which a cart was kept. Sir, - May I thank the many members of the Berwick Fire Brigade, the Bush Fire Brigade, and the Upper Beaconsfield Fire Brigade and many others who came to our assistance on Friday, Saturday, and Sunday nights, in beating the fires and saving my house and portion of my garden? One of the worst bush fires in the memory of the oldest residents occurred here on Friday and Saturday, when a devastating fire swept over the district. On Friday, a fire, which had been burning in the scrub, fanned by a strong north wind, menaced the residence of Mr. McMillan, and in response to a call for help, about 50 men were soon engaged in a fierce fight to save the house and outbuildings. This they managed to do, and the fire then jumped the main road and threatened the residence of the Misses McLean; a break was burned, and the house was safe. On Saturday morning another fire commenced near Miss McLean's boundary fence, and soon the residences of Messrs. Blair, Baker and Gilpin, and a number of others were in danger. A large band of willing workers managed to save the houses, but unfortunately they could not save the fine lemon orchard of Mr. McMillan, which was destroyed, also a week-end residence of Mr. Harkins. The heat was so great when the place got alight that it was impossible to get near it. In the afternoon a sudden change of wind to the south caused the township to be menaced, and a desperate call for help was sent out, and in reply volunteers from Berwick, Narre Warren and Dandenong came to augment the local Bush Fire Brigade, until there were over 200 men, under the direction of Constable Barrett, and other leaders, engaged in the desperate effort to save the homes of Madame Mortagne, Messrs. McBride, McDonald, Harvey-Smith, Rev. T. Greenwood, Robinson, J. Campbell, Major Campbell, Miss Elliott, J. Deville, C. Ellis, Claydon, Wright, Binding and Brown. The worst fight was at "Kyogle," Mr. McDonald's house; at one time it was felt that this fine residence would go, but the determined fight put up by the willing workers saved it. Here it was that anxiety was felt for one band who had become surrounded by flames, but they managed to get clear, although some of them succumbed to heat and smoke after getting out. The fine garden and plantation of Major Campbell was swept by the fire, despite the efforts of the workers, and hundreds of pounds worth of valuable plants and trees were destroyed, and the fine house was only saved by the superhuman efforts of the fire fighters. Miss Elliott's house got alight, and part of the roof had to be stripped off before the fire could be put out. Mr. Ellis had the fence and pavilion attached to his tennis court destroyed, and the fire swept through his orchard, only being stopped within a few feet of the house. The house of Mr. Wright was saved by burning a break, as was Mr. Brown's house and lemon orchard. On Sunday afternoon a small fire developed in Salisbury Gully, but it was soon got under control; whilst this was being put out an urgent call for help came from "The Towers," Mr. Berglund's property. A large body of men were rushed out, and the fire was got under control before very much damage was done. On Sunday a fire, which had started on the Saturday in Cordner's Gully, crossed the Officer rd., and threatened the orchard of Mr. F. Love, but it was kept out, and, with the exception of the loss of some fencing, not very much damage was done. Most of the above properties were located along St Georges Road, the Misses McLean were at 'Ardgour' (now Staverton), the McMillan's were at 'Windrush'. The Cordners were at 'Yuulong' on Salisbury Road. UPPER BEACONSFIELD. Several Houses Saved. - Yesterday, the fifth day of the fires in this district brought no relief from fire fighting. The day was hot and the wind fierce and changing. The fire that had burnt towards the properties on the old Harkaway road on Sunday had made those places safe on the south side but a fire burning up the Cardinia Creek came in from the west, and for a time the houses of Mr. Begg, Colonel Morris, General Foott, and Dr. Wade were in serious danger. North Beaconsfield had the worst share of the fire. Dr. McArthur's property was threatened, but a change in the wind took the fire along the ridge. Mr. Lewis's sheds were burnt, but the house was saved. Some of the fire-fighters were trapped by the flames and had to fight their way to safety. An untenanted week-end house in a lane near Mr. Lewis's property was destroyed. The fire swept on towards the orchards of Messrs. Black and Morgan. Mr. Black's sheds and outhouses were destroyed. The properties of Messrs. Hamilton, Savery, and Berglund, which had been threatened on Sunday, but apparently made safe from the east, were again in danger. Early this morning a strong south breeze brought a cool change. There is now no danger to houses so complete has been the destruction of undergrowth. Early last week bush fires broke out again. On Tuesday morning a call came from Montuna, to subdue a fire there, that was threatening a number of week-end homes. The Bush Fire Brigade burnt a break, but not, unfortunately, until portions of Mr. Geo. Grant’s orchard had been destroyed. Whilst they were away another call came for help to quell a fire that had broken out on Judge Bevan’s property, and which threatened Mrs. Wheeler’s cottage and Mr. F. Funnell’s orchard; however, it was “got under’’ before much damage was done. In the afternoon a fire started on Dr. McArthur’s property, and, fanned by a strong wind, it swept over a big tract of country. Dr. McArthur’s sheds and outbuildings were only saved, after hard work. The fire then got into Mr. G. Lewis’s place, and all his sheds, including carts, harness and implements' were destroyed, and the house was saved with great difficulty. Whilst the fighters were concentrating their efforts to save Mr Lewis's house, the fire swept on to Mrs. Bennett’s whose house was destroyed. Mr. Morgan’s large sheds were destroyed, and one corner of his house was burned before the fire could be checked. All the valuable orchard implements, including a power spray pump, was destroyed in Mr. Morgan’s sheds. Another fire broke out at the head of the Cardinia Creek and burnt all the outbuildings, including a detached kitchen at Mr. Ladds; the house was only saved after a hard fight. On Wednesday a fire started in the gully opposite Mr. Armstrong’s, and a break had to be burnt to save Mrs. Renfree's, Miss McConachie’s and Messrs. Armstrong and Landor’s houses, as the wind was blowing fairly strong. Some members of the brigade were on duty all night to prevent the fire spreading to Messrs Ballanytyne’s, Walker’s, and Baxter’s places. On Sunday night the brigade was called out to burn a break to save Mr. Walker’s fine fernery from being destroyed, as a fire was coming up the Haunted Gully. One of the biggest saves made in the Dandenong Ranges during the week-end was of Mr W. Bergland's fine property at North Beaconsfield. The fire swept through a gully and attacked the property fiercely. The fire had to be fought over a 10-mile front on Saturday and Monday. It was most fierce from Beaconsfield to Upper Beaconsfield. At times there were 1000 people beating it. On Thursday, just after midday, the fire brigade Were called to Montuna, to quell a bush fire which had started on the Cardinia Creek, and which threatened a number of week-end cottages. The hardest fight centered around Mr. Luke’s house, and at one time it was feared that the house would be burnt, but after a desperate fight the fire was beaten back just as it reached the walls of the building. All the efforts of the fire fighters could not save the orchard, and the fire swept through it. The fire got on to the Montuna golf links, but was prevented from doing much damage. Whilst this fire was in progress another call came for help to save Mr. C. Harris’s large sheds and firewood mill; a number of men turned out, and the sheds and mill were saved, as also was Mr. Funnell’s fine orchard. Unfortunately a quantity of wood stacked in Mr. Syd Smith’s paddock was destroyed, and at one time his out-buildings were in danger. At half-past seven on Friday morning another call for help came from Mr. Johnson; a fire was sweeping up along the Stony Creek and threatened the houses and orchards of Messrs. Johnson, Appleby, Thomson and Horrigan. Fortunately, when the danger was greatest, the wind changed and rain commenced to fall, which put the fire out. A public meeting, convened by the Bush Fire Brigade, was held in the Hall during, the week. There was a large attendance, and the captain, Mr. U. a’Beckett, occupied the chair. He stated in his opening remarks, although the brigade had helped to save about 40 houses from destruction during the recent fires, they were hampered by a shortness of material, and they had called the meeting to try and devise some means of raising funds. After a good deal of discussion it was decided to canvass the district for subscriptions. LARGEST BUSH FIRE EXPERIENCED FOR YEARS. The north wind that started to blow on Monday night brought the fire that had been burning along the Cardinia Creek up towards the properties situated on the old Harkaway road. These were in serious danger but, although the grass on the properties was destroyed, no damage was done to the houses, which are owned by Rev. Wade, Colonel Morris and General Foott, as well as the properties of Mr. Begg and Mr. Albers. It was found that with as northerly wind the property of Dr. McArthur would be threatened, and a party of volunteers went forward to render assistance. The shifting of the wind to the south-west, however, saved the situation. North Beaconsfield suffered badly. Mr. Lewis had a very hard fight to save his house, but it was found impossible to prevent the destruction of the outbuildings. Mr. Black, who had been helping to stem the danger at Mr. G. Lewis's house, arrived at his own home to find the outbuildings ablaze, and strenuous work was needed to quell the flames. An unoccupied holiday home in a lane nearby was completely destroyed. Although, the properties owned by Messrs. Hamilton, Savory and Berglund were made safe on Sunday on the east side, the fire on Sunday came from a different point and again endangered them, and it was found necassary to burn breaks. The fire that had threatened Mrs. Wheeler's property on Monday afternoon broke out again on Tuesday in the long grass, and Mr. Funnell's cottage was also endangered. However, it was dealt with in time, and no damage was done. An alarm came from the back of Luke's store, where a fire jeopardised the safety of several holiday cottages adjoining the store. A body of volunteers went down and burned a break, and the danger was averted. It would appear that there is now no immediate danger, and the cool spell has come as a welcome relief to the men who have been fighting the flames continuously for five days. This has been one of the worst bush fires experienced for many years, but there is the satisfaction about it th at all danger of fires for some time has been rendered almost negligible. During Tuesday's fire several volunteers found themselves in some very awkward situation through being trapped in a wall of fire, and they experienced some anxious moments before reaching a place of safety. Since last Wednesday week there has been no dangerous outbreak of fire in the district. Several of the residents have taken the opportunity to burn fire-breaks and making their properties secure, and the hope is expressed that there will be no further outbreaks this season. During the last week Pakenham district has experienced the most extensive fires in its history—far worse than those on "Black Sunday" in 1926—and that the damage done was not far greater seems miraculous. On Friday, Saturday, and Sunday a fire raged fiercely in the country on the Melbourne side of Toomuc road, from beyond Toomuc Valley almost as far the Prince's Highway. Several homesteads were saved only after stern fights, the number including those of Messrs. Hale, Croxford, Heather, and Thompson, and "Caversham Heights." At the latter place some fowl pens and sheds were burnt. The same day there were big blazes in the Officer, Upper Beaconsfield and North Narnargoon district. At Upper Beaconsficld two week-end homes were destroyed, and an unoccupied residence at North Narnargoon were also burnt down. Deep Creek Reserve (on Prince's Highway) was ablaze on Saturday, and for a time it appeared that the properties of Messrs. T. Yates and T. Ryan would be endangered (says the Pakenham "Gazette"). A number of men were out on Monday afternoon and evening fighting an outbreak in the area bounded by Gembrook and Ahern's roads, but it was not till the following day that this assumed really serious proportions. Early on Tuesday afternoon it was right out of control, and the ringing of the fire-bell called all the Fire Brigade members and practically every other man from Pakenham to scene of it. To the splendid work of hundreds of volunteers can be ascribed the saving of at least a dozen homesteads. The Dewhurst district has a had a fair share of bush fires. The hills are scorched from east to west and well across from north to south. Two week-end properties were destroyed and several owners lost their sheds and contents. Mr. K. Morgan was very fortunate indeed. His house was saved just in time, a small portion being burnt. Fencing is destroyed, and cattle are free to wander anywhere. The best thanks of the several property-owners are due to those fire-fighters who fought so strenuously to save their homes. Big fire at Upper Beaconsfield. The fire at Upper Beaconsfield raged on Friday and Saturday, fanned by a strong wind, and was one of the most serious conflagrations that occurred for some time. McMillan's house and orchard were threatened and the house sustained serious damage. Mr. Cordner's property on the Officer road was endangered, and a summer house was destroyed. On Saturday the blaze assumed very serious proportions, under the influence of a stronger wind, and the houses on top of the ridge on St George's road were placed in serious jeopardy. The Berwick Fire Brigade and beaters were out in full force, but deemed it expedient to seek assistance from Dandenong, and some 30 or 40 men went out to assist. Mr. Cordner's buildings were saved only after strenuous exertions, and the fire burned right up to a property named Kyogle, but did not burn the house. Mr Berglund's property was severely burned, and there was an outbreak at the bottom of Cr. Bevan's property, which threatened to destroy Mrs. Wheeler's house. Good saves, however were effected by the fire-fighters. A great tribute for invaluable assistance was paid to the postmistress, who by concentrated work, kept all parts of the district in touch with developments. The annual meeting of the Bush Fire Brigade was held in the hall last Thursday evening. The captain, Mr. U. a’Beckett, occupied the chair, and there was a large attendance of residents, who evinced a keen interest in the proceedings. The report and balance-sheet, as prepared by the treasurer, showed that the last year had been a strenuous one and that although the brigade had added a good deal of equipment to the truck, they still had a small credit balance, and he appealed to all residents to assist them so that they might at any time be able to be of service to them. The election of office-bearers for the ensuing year resulted as follows: Captain, Mr. U. a’Beckett (re-elected); vice-captains, Colles, J. Glismann and B. Luke; secretary and treasurer, Mr. H. B. Burton; motor-man, Mr. K. Hudson; ladder-man, Mr. J. Baxter; district officers and committee, Mrs. Colles, Miss Stenhouse, and Messrs. Albers, P. McArthur, Fisher, Hamilton, Knapton, Hurditch, McBride and W. Brown. The local Bush Fire Brigade got their first call last Monday afternoon, when they were summoned to “Pine Lodge,” Mr. J. Cowcher’s property at Quamby. When they arrived, they found that Mr. Bert Luke, one of the brigade officers, had organised the local residents, and had held the fire in check. After half an hour’s work the fire was put out, and not much damage was done. About five o’clock the brigade was out again, a fire having started in Mrs. Brown’s property, and threatened to wipe out the township. For about an hour over forty men fought hard to prevent the fire from crossing the main road. Their efforts were successful, although the fire had crossed the road in two or three places it was put out before it had time to get a good start. Fortunately the wind changed, and then the danger was past. The brigade kept a man on watch during the night to give the alarm if the fire started again. A quantity of fencing was destroyed, and all the sheds belonging, to Mrs. Brown were burned, and her house had a narrow escape. 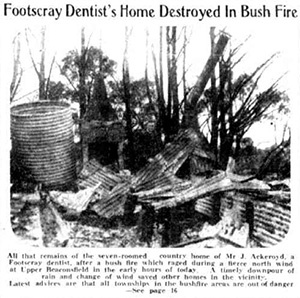 All that remains of the seven-roomed country home of Mr J. Ackeroyd, a Footscray dentist, after a bush fire which raged during a fierce north wind at Upper Beaconsfield in the early hours of today. A timely downpour of rain and change of wind saved other homes in the vicinity. Antiques, oil paintings and historical relics, worth thousands of pounds, narrowly escaped destruction in the bushfire which swept through the hills near Berwick early today and burnt a six-roomed week-end home belonging to Mr J. Ackroyd, a city dentist. The fire approached within 100 yards of Miss Ada Armytage's homestead, "Holm Park," at Upper Beaconsfield. But for a sudden change of wind Miss Armytage's home, a weatherboard house where Mr J. Binks and five children live, and other houses would most likely have been destroyed. Miss Armytage's house contains antiques dating back hundreds of years. They include a mirror used by Marie Antoinette, which was taken from the Tuilleries in the French Revolution; a Bible printed in 1602 (claimed to be the oldest in Australia); one of the first pianos ever built, and hundreds of pounds worth of old silver and other ornaments. Many of the oil paintings in the house are by famous artists of last century, and have never left the Armytage family. impossible to control the flames. Just when the position was desperate, the wind veered to the west, and soon after wards heavy rain fell. Mr Ackroyd's house was furnished. It was insured. Just after midnight, on Monday, 10th inst., the local Bush Fire Brigade got a call to help fight a fire that was burning on the east side of Mount Misery, and so complete is the organisation of the brigade, that within a few minutes of the call being received, the first car load was despatched, followed at short intervals by two more. Fortunately just as they reached the scene of the fire the wind changed, and it was soon got under control, but not before Captain Ackroyd's week-end bungalow was destroyed, with its contents. The sheds and outbuildings were saved. It is estimated that over 150 residents of Berwick and surrounding districts were fighting the fire when the wind changed. Following quickly on a change of wind to the south, which eased the bush fire position at Upper Beaconsfield this afternoon, the wind veered to the north again and the blaze, which 150 men had been fighting all night, gained new life. Properties owned by Major Charles Campbell, Mr J. Campbell, and Mr. W. Robinson were swept, and a general alarm was sounded in the township. A cricket match was stopped and players joined the fighters. Last night the fire swept open country and properties owned by Messrs J. Binding, A. J. Brown and Mrs. Critchley Parker were in danger of being burnt out. While women of the district prepared refreshments, all available men, splitting into three parties in the darkness, attacked the fire, which until then had been gaining rapidly. The Binding and Brown properties were made safe after several hours of gruelling beating, but it was not until daybreak that Mrs Parker's homestead was out of trouble. Big breaks had to be made, and in some instances, the fire was stopped right on the edge of the breaks. BEACONSFIELD UPPER Sunday - A bush fire menaced the township of Beaconsfield yesterday, but 200 fighters checked th spriead of the flames and a heavy downpour of rain virtually extinguished the fire which was the most serious one. In the district this summer. Had it not been for the good work of the bush fire brigade assisted by volunteers, considerable loss of property might have occurred. The fire began on Friday in the gully below Mr McMillan's house on the main road from Beaconsfield to Beaconsfield Upper. A south east [sic] wind carried the fire up a gully to the back of the properties of Messrs Wright and Binding. It was checked there by beaters but crossed the road and damaged the orchard of Mr Walter Brown. The wind dropped in the evening and it was considered that the danger had passed. On Saturday morning, however, the south west wind carried the fire up an other gully and only excellent work by the brigade and others saved the houses of Miss Elliot and Lieut Colonel Campbell. The wind was working round toward the township. To prevent that danger the brigade under the direction of the captain (Mr a'Beckett) burnt a break of about three quarters of a mile. BUSH FIRES. BIG BLAZE AT BEACONSFIELD. Confined to the Ranges. Highly exaggerated reports were received on Saturday of a fire at Upper Beaconsfield, and at first sight it appeared that serious damage had been done. As a matter of fact, the damage was slight — the fire was practically confined to the ranges and Crown land. The bush fire brigade, led by Captain U. a'Beckett, did splendid work. Fire breaks were made, ensuring for the properties in the vicinity reasonable safety. Then the rain came, and the district is now reported to be safe, with the fire well under control. About 75 local men attacked the flames, and they received valuable help from the members of the Clyde cricket team. The team had visited Upper Beaconsfield to meet the local team, but owing to the fire the match was abandoned, and the cricketers, in sporting attire, turned to the more strenuous task of fire fighting. The only properties in danger were those of Mr. Colin Wright and Mr. Binding, and they were saved. The fire had been burning in the ranges for several days, and the position might have become serious but for the prompt response of the fire fighters. A branch of the fire extended to Begg's orchard, but did only slight damage. The first serious bushfire of the season occurred on Friday and Saturday. A fire, which started on the Cardinia Creek, in Borchardt’s property some few days before, assumed alarming proportions, and the bush fire brigade were called out; by this time the fire had reached Messrs. C. Wright’s and J. Binding’s property, and only by hard work were they saved. In the meantime the fire had leaped the road and destroyed a number of fruit trees, the whole of the passion fruit plantation and a splendid row of pine trees belonging to Mr. Walter Brown. Mr. A. J. Brown’s lemon orchard was only saved by the super-human efforts of the fire fighters. When night came it was thought the danger was over, but unfortunately on Saturday morning the wind came up and the fire broke out afresh, and soon the residences of Major C. Campbell, Miss Elliot, Mr. J. Campbell and Mr. F Robinson were in danger, and a call went out for more helpers, which was soon forthcoming. The cricket match, between Beaconsfield Upper and Clyde, was abandoned, and the players helped to keep the flames in check; to save the township it was decided to burn a break about three-quarters a mile long, and here the captain of the local bush fire brigade (Mr. U. a’Beckett) had a force of over 200 men under his control. The break was safely burned, and the township made safe. About six p.m. a thunderstorm came, and put the grass fires out, but it still needs watching, as a number of trees and logs are still smouldering. On Saturday, whilst the bulk of the fire fighters were concentrated near the township, a fire broke out near Mr. Begg’s fine orchard, and caused anxiety for some time. However, it was eventually got out before much damage was done. Before finishing, I must mention the large part the women played during the two days that the men were employed beating out the fires. They banded together and saw to it that every man had abundance of both solid and liquid refreshments, and carried them right up to where the men were working, through the smoke and heat. BEACONSFIELD, Wednesday.— Beaconsfield district had a busy day coping with menacing fires in all quarters of tho compass to-day. A fire started at the junction of Kardinia and Stony creeks, and swept along a gully towards Berwick, where it was stopped by the Berwick bush fire brigade. A woodcutter lost his hut and belongings, and a quantity of firewood. Grass land was also swept. At Upper Beaconsfield a call was made on the local bush fire brigade to Mr. Ulick a'Beckett's property, where an outbreak was quelled. This evening a further call was made to save C. Walker's property, a break was burnt, and succeeded in turning the fire towards the reservoir and into the open ranges. North Beaconsfield reports that a strong northerly to-morrow will result in much damage from a fire which is approaching from the direction of Selby. With all these alarms everyone to-night is on the qui vive. An outbreak started to-night in the park between the Berwick and Beaconsfield bridges, and is being closely watched. RINGED BY FIRES. Danger at Gembrook. Many small fires burned all day in the Gembrook area yesterday. The township was surrounded last night by a ring of fires, some of which are only half a mile away from the settlement. The fires were not causing anxiety, but a serious situation will be threatened if there is a strong north wind. In the ranges between Beaconsfield and Officer volunteer fire-fighters were engaged all day in preventing the loss of property by three fires, which burned from the hills down into the settled area. One of the fires started in the range immediately above Officer, and moving down a valley, threatened the homes of Messrs. Cole, Hore, Carpenter, and Reed, and Captain Griffin's. The Officer Bush Fire Brigade spent several hours in a strenuous fight to save the homes, and ultimately managed to isolate them by burning extensive breaks. By nightfall the danger had passed. A second fire started near The Towers, on the top of the range. Fanned by a steady wind, it extended rapidly, and threatened the home and orchard of Mr. Osborn. An appeal for help was sent, and a large body of volunteers saved the property. A third fire burned all day in the ranges between Beaconsfield Upper and Gembrook. At one stage it threatened the home of Mr. E. Bennett. A fire break, hastily made by volunteers, saved Mr. Bennett's property. FLAMES RISE 60 FEET. Homes Were in Danger. A roaring inferno of fire, in which flames readied a height of 60ft., confronted fire-fighters at a break between the properties of Mrs. I. S. Norbury and the Rev. T. Howard Smith at Upper Beaconsfield to-day. 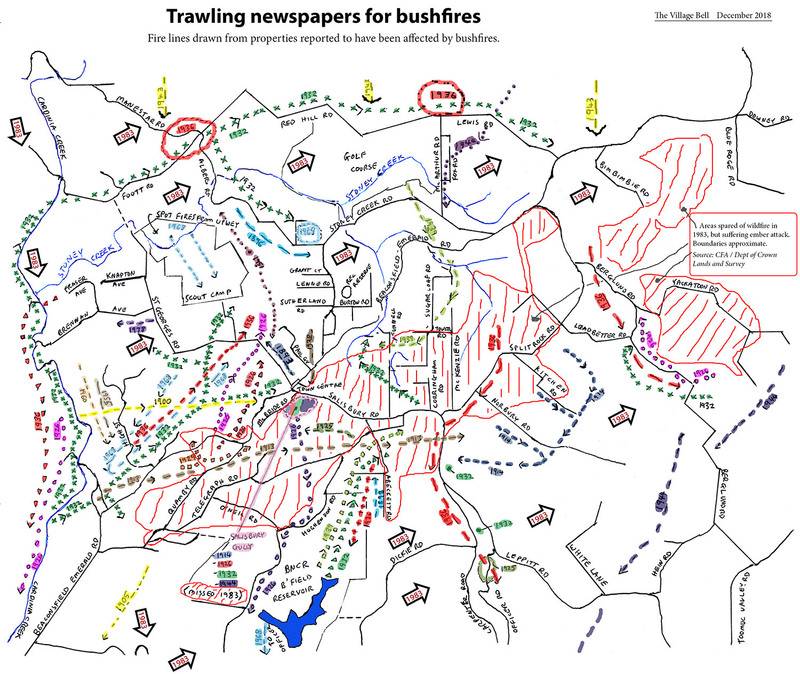 The whole Upper Beaconsfield ridge was ablaze, but, after an exhausting fight, 60 members of the Upper Beaconsfield bush fire brigade saved the properties which were in danger. Fanned by a northerly wind, the fire, which had been under control on Tuesday night, broke out afresh this morning, and within a few hours huge clouds of smoke reduced the range of visibility in some parts of the district to 10 yards. The properties which were in the greatest danger were those of Mrs. Norbury, Messrs. C. A. Berglund, E. Wintle, H. Albers, and Vickers. Messrs. Wintle and Vickers lost a considerable area of grass, but all the properties were safe late this afternoon. A hundred men are fighting three large fires at Upper Beaconsfield; and appeals for more men have been sent to Beaconsfield and Berwick. The properties of Messrs. H. Burton, Colin Begg, George Buckley and Dr. Arthur Day are all seriously threatened. Late this afternoon no men were available to cheek the flames advancing on Mr Buckley's home. In some parts the undergrowth is from 12 to 14ft. high, and the fires have now spread from the gullies, where they started, on to the surrounding hills. —The first bush fire of the season started this morning in a gully close to Telegraph-road, and by afternoon it was necessary to call out members of the local bush fire brigade to check the flames. Several homes in the vicinity were in danger, but after a strenuous fight the fire was checked and safety assured before dusk. Watches will be on duty at various points during the night, prepared for possible trouble in the morning, in the event of a change of wind. BERWICK-The most serious fire has been on the Sugarloaf at Beaconsfield Upper where the Upper Beaconsfield brigade under Mr Dave McDonald saved the homes of Messrs Funnell, Richardson, Sulman, Savory, Joseland, and Edwards. Another fire broke out near the forest plantation of Mr H Dowling but late this evening was under control. Regarding, a recent fire which broke out on Sugar Loaf Hill, Upper Beaconsfield, Cr. D. N. McBride, chairman of the Upper Beaconsfield Bush Fire Brigade, has intimated that the captain of the brigade (Mr. C. D. Colles) was in charge of fire fighters, and was assisted by five lieutenants —Messrs. Luke, McDonald, Glismann, Richardson and Begg, as well as 40 volunteers. The fire at times assumed ugly proportions, and only by the prompt and energetic effort of the fire-fighters was the blaze eventually controlled. BLAZE NEAR BERWICK. Homes in Danger. A week-end home was destroyed and several other properties were endangered by a fire, which broke out shortly after 2 p.m. today near the reservoir, between Beaconsfield and Beaconsfield Upper. Strenuous efforts on the part of the fire-fighters saved the homes of Mr. Ballantyne, Dr. Day, Miss I. Bennie, and Mr. K. Hudson. Other houses which were in danger were those of Judge Bevan (the hedge of which caught fire), Mr. U. a'Beckett, Mrs. Renfree, Mr. Hudson, sen., and Mr. C. R. Walker. Mr. Walker was delivering a lecture in Berwick in aid of the bush-fire appeal when he was called to his home. A change of wind to the north or east tomorrow would again make the situation very serious. Embers from the Selby fires were blown yesterday by the strong north-easterly gale through the forest, and towards evening serious fires broke out in the bush between Cockatoo and Upper Beaconsfield. Several houses were menaced by the flames, and an urgent call for assistance was sent to Dandenong. As a result a party of fire fighters was organised by the president of the local bush fire brigade (Mr. C. Colles) and Constable Bryant, of Berwick. After several hours of strenuous work those fighting the fires saved several properties from destruction, but they were unable to prevent the week-end residence of Miss D. Rogers, which was unoccupied at the time, from being destroyed. A number of sheds, garages and outbuildings were razed by the fires. The exhausted fire fighters spent last night in the fire zone, as there was a danger that fresh outbreaks would occur. At a late hour it was reported that the fires were moving in the direction of old Narre Warren, but there was no immediate danger of their getting out of control. An appeal for fire fighters was received from Upper Beaconsfield on Monday evening, and the ringing of the fire bell called out a large number of volunteers. Unfortunately the fire brigade members were absent owing to the firemen’s demonstration at Warragul. Many people, however, went to the scene of the fire, and members of the brigade on their return home also went to the rescue. Good work was done, and a number of homes were saved, including that of Mr . C. R. Walker, which was in danger. Mr. Walker was in Berwick to deliver an illustrated lecture on behalf of the Bush Fires Relief Fund. The lecture was, however, postponed. Fire fighters for Beaconsfield, Upper Beaconsfield, Berwick and Dandenong assisted in quelling the outbreak. The week-end home of Miss Rogers and a number of sheds on other properties were destroyed. informing him that his home and property were in danger of being destroyed by bush fires, which had started during the day. In consequence the entertainment was postponed. Mr. Walker’s home was saved, but much damage was done to the surroundings. Moving pictures of the fires on the previous Monday and on Saturday following were shown, and the destruction caused was depicted. The programme generally consisted of a Reso trip through New Zealand, sporting and other scenes in Britain and Australia. A vote of thanks was accorded to Mr. Walker, on the motion of General Foott. DELEGATES to a conference of district Bush Fire Brigades held at Upper Beaconsfield last week, viewed with alarm the apathy of many land-owners towards the activities of Bush Fire Brigades. It was pointed out that in their own interests all should take a great interest in their work and assist them in every way possible. It was decided to ask Lysterfield to form a brigade if possible and so provide protection for an area to the north of North Narre Warren at present in no brigade’s district. At the meeting, which was presided over by Cr D. N. McBride, it was decided to form the Beaconsfield Upper and District Bush Fire Brigades’ Group and hold a conference every October. Officers elected were: President, Cr D. N. McBride; sec. and treas., Mr W. H. Carne; committee, Pres., sec., Cr T. Whiteside (Berwick) Mr J. Richardson (Beac. Upper), Mr D. C. Black (Pak. Upper), and an Emerald representative. Delegates expressed apprehension regarding the grave danger of fire which may arise through the thoughtless removal of live coals from gas producers. Constable Briant, of Berwick, suggested that landholders in their own interests, if they saw any one emptying, live coals out on a road should immediately report to the nearest police station details of the make and number of car, also time and date of offence. It was also decided to ask the Berwick Shire Council to request the Country Roads Board to burn the grass along their roads in Berwick Shire as soon as possible, to reduce the danger from gas producers. FORTY-THREE members of the Upper Beaconsfield Bush Fire Brigade turned out last Wednesday and, working from 1 p.m. to 10 p.m., burnt about a mile and a half of breaks to reduce the risk of bush fires during the summer. Bush fires broke out and spread over wide areas in many parts of Victoria during the hot spell last week. No loss of human life was reported, but large numbers of livestock perished, many homes and other buildings were destroyed, and considerable damage was done to fencing, haystacks, farm machinery, and other property. Hundreds of miles of thick scrub country was burnt. Forestry Commission officials yesterday said that no outbreaks, in State forest areas had been reported. A fire broke out in the lower Dandenong Ranges between Emerald and Upper Beaconsfield. Fanned by a stiff breeze, the flames raced through thick scrub country away from the township of Emerald toward Upper Beaconsfield by way of the district of Dewhurst. The fire burnt on a mile-wide front. Firemen from the Berwick town brigade and Upper Beaconsfield bush fire brigade, using motor pumps for some hours, checked a fire which had been burning for 2 days, when it was within half a mile from Upper Beaconsfield. Firefighters had a difficult job in saving the home of Mr Walker, near the township. Before being checked the fire had raged over 5 miles, destroying grass and fencing. Holiday visitors aided Upper Beaconsfield and Berwick fire brigades in bringing under control a fire which started in the scrub near Upper Beaconsfield on New Year's day. There were several narrow escapes as houses were threatened, but with a change of wind the fire was blown back on itself in the afternoon, and the fire fighters were able to attend to blazing stumps. Rain at night finished off the brigades' work. Between 300 and 400 acres of bush and a small area of grassland were burnt. It is believed the fire was deliberately lighted. Cr. D. N. McBride, chairman of Upper Beaconsfield fire brigade committee, expressed appreciation of the help given by holiday makers when matters looked desperate. HOLIDAY visitors aided Upper Beaconsfield and Berwick bush fire brigades and the Berwick Fire Brigade in bringing under control a fire which started in the scrub in Salisbury Gully near Upper Beaconsfield on New Year’s Day. There were several narrow escapes as houses were threatened, but with a change of wind the fire was blown back on itself in the afternoon, and the fire fighters were able to attend to blazing stumps. The blaze got to within half-a-mile of the township. Fire fighters saved Mr. Walker’s home only with difficulty and much fencing was destroyed. Rain at night finished off the brigades’ work: after a strenuous 30-hour battle. Between 300 and 400 acres of bush and a small area of grassland were burnt. It is believed the fire was deliberatly lighted. Cr. D. N. McBride chairman of Upper Beaconsfield fire brigade committee, expressed appreciation of the help given by holiday makers when matters looked desperate. On the outskirts of the hills area extensive fires occurred yesterday between Gembrook, Pakenham, and Upper Beaconsfield, extending toward the hills from Prince's Highway. No homes were lost, but there were some excellent saves, including that of the Central Hotel at Beaconsfield. Most serious outbreak was in rugged country in the Toomuc Valley and it extended about 10 miles from Pakenham to Cockatoo. Some orchards were destroyed, but the fire largely went through dense bush and scrub, and caused little damage. The fire was still burning late last night, and was travelling due north between Berwick and Pakenham. To date no houses or stock have been lost. PAKENHAM, Sunday. — Heavy damage was caused In Pakenham district yesterday in the worst fire in its history. The most remarkable feature of the outbreak was that although hundreds of homes were menaced, only one unoccupied and two occupied houses were destroyed. The loss of stock was negligible. A race meeting was in progress on the local racecourse on Saturday afternoon, when a call went out for fire fighters. One race had been run, and the meeting was then abandoned, many of the spectators turning to as fire fighters. On Saturday morning two fires occurred. One came from the Toomuc Valley area and the other on the western side of Toomuc Creek, adjacent to the Princes Highway. Men went to Brown's home, in the Toomuc Valley area, where the fire was swept along by a strong hot northerly wind. It burnt all the sheds on Brown's property, then freshened and broke in all directions. One branch swept round from Cemetery Hill towards Old Pakenham, destroying kerosene, bitumen and plant in the Country Roads Board depot, also an unoccupied house. The fire at this stage menaced the whole of Old Pakenham, and was going on to Pakenham East, Pakenham, Dandenong and Berwick brigades came to the assistance of local fire fighters. They worked desperately to save the townships. For a time the post office was threatened, and was out of action. The army had sent a two-way wireless equipment to the scene, and this unit kept up communications for some time, until ordinary communications were restored. Many army personnel were also engaged as beaters. These included many men who had voluntarily given up their leave to aid in fighting the fires. The wireless-communication unit kept up communications until the fire came too close, and then it moved on to a safe location. While one pump was being employed on properties at Old Pakenham a break was burned at McGregor 's-road to protect Pakenham East. The fire jumped the break and poured down through back yards of Main-street properties, where it was checked, and just when the position appeared to be safe it swung round with a change in the wind, and menaced the hospital and other properties. The same thing happened with the fire on the opposite side of the Highway. Mr. H. Durkin's home with all its contents was completely destroyed, and the home of Mr. White was also burnt down. When the fire was checked, temporarily it seemed, rain began About an inch fell through the night, and the fire was extinguished. LAST FRIDAY AND SATURDAY in the worst fires the Pakenham district has ever experienced, only the desperate efforts of hundreds of firefighters and the assistance of the Pakenham, Dandenong and Berwick Fire Brigades, saved the Pakenham East township from being destroyed. Residents had moved their personal belongings out on to the road, and at one stage the hospital was in danger. Two fires were burning in the Toomuc Valley area on Friday and late on Friday night another one broke out on the Prince’s Highway on the Melbourne side of the Toomuc Creek. It was stopped at the creek. After a strenuons battle all Friday afternoon the fire swept into bush country in the late afternoon and tempor arily relieved the danger. The danger area was patrolled next morning but the rising wind started the blaze going again in numerous places, and soon the flames were on the outskirts of the township. The races, which had been started, were abandoned after the first event and hurried calls were sent for military aid, and to all neighbouring towns. Mr. H. Durken’s house and contents, in Pakenham East. Sheds at the rear of Messrs. Moon’s and J B. Jackson’s ((Mr. Jackson is captain of the local Fire Brigade). The CRB. Depot, together with shed, plant, bitumen and kerosene. House and contents at end of Ahern’s road, owned and occupied by Mr. White. Unoccupied house at Old Pakenham. Two-roomed place in Ahern's road (unoccupied), owned by Mr. P Lees. Three thousand acres of grass and mile upon mile of fencing. Fortunately practically no stock was lost. The Dandenong Fire Brigade’s big International fire engine in charge of Captain J. Bellett, A/O. Jack Andrews, and three auxiliary firemen did an amazingly good job, as did the Berwick brigade under Syd. Richardson. Going down, the Dandemong fire engine could not get through at first as the fire was over the highway, and traffic had to be diverted through Kooweerup. In fighting the flames, local firemen used 2000 feet of hose. Dandenong firemen also manned! the Chelsea pump and took it over to fight the Boronia fire. WITH A LARGE FIRE burning only a few miles out of Pakenham East, where they were meeting, and with the firebell next door tolling urgently for firefighters practically the whole of the afternoon Berwick Shire councillors last Friday discussed the bush fire menace at length and decided to seek the banning of all gas producers from the roads until March 1. WITH the fire threatening a number of homes, the shire office became a central bureau for the direction of operations, despatching truck-loads of men to danger points at intervals, and the council meeting proceeding with an undercurrent of uneasiness. Cr. Mick Bourke left to join tthe fire-fighters and other councillors were back and forth to the ’phone, bringing reinforcements from other districts and receiving reports of losses and saves. At 4.45 p.m. a call was sent to Melbourne for 50 soldiers to help fight the flames. It was no wonder then, that practically half the time of a rather unsettled meeting was given to discussing bush fires and preventive measures. QUITE A DISCUSSION occurred when a letter was read out from Mr. E. B. Giles, of Pakenham East, expressing con cern at the existence of fire hazards in the district. He expressed surprise at being told that rules and regulations prevented anything being done by the Fire Brigade until a fire actually broke out, and claimed that it would be much better to have these danger spots wiped out under the control of the Fire Brigade co-operating with the householders in the particular area. He added that he was only one of many who thought something should be done im mediately to remove these hazards. “In your opinion would it be safe to burn fire hazards?” Cr. Greaves inquired of Cr. D. N. McBride, chairman of the local “G” Committee. “Yes—now that the regulations have been amended,” replied Cr. McBride. “This has only been done in the last 24 hours and hazards can now be burnt off any one of 4 authorities (Country Fire Brigades, Bush Fire Brigades, Forests Commission and Council) with the consent of the “G” Committee. The Secretary: Any man who lit a fire today ought to thrown into it! The Secretary: You’d want to take a lot of precautions! Cr. McBride expressed the opinion that as soon as they got decent weather they should burn off all fire hazards. He thought the CRB. would burn off the highway with the help of Bush Fire Bri gade and accept responsibility. Cr. Greaves: The sooner the highway is burnt the better for everybody. EIGHT FIRES AT NAR GOON Cr. J. G, Dore told councillors that down near his property last week fires broke out at eight different places within a mile along the road. One report said that boys were responsible. Others sur mised that a faulty gas producer was to blame. He did not know which was cor rect, but the fires had happened. Cr. McBride thought a conference of the “G” Committee might be held. HOSTILITY TO GAS PRODUCERS Cr. Greaves suggested that the use of gas producers should be cut out in the bad season. It would be better to use up petrol than to have the national calamity experienced in recent weeks. Cr. Dore thought it would be a good idea to have a regulation that all gas pro ducers must be presented for expert in spection within stated periods. He was sure some of them were faulty. Cr. McBride: Make it every 3 months. BAN THEM IN DANGER PERIOD Cr. Robinson: A better suggestion would be to ban them altogether during the danger period. I think there are many faulty producer units on the road and they are a definite menace to the whole countryside. There is plenty of petrol in the country now. Let them use some of that. Cr. Dore didn’t think it feasible to ban gas producers altogether. “It wouldn’t hurt to use a few million gallons of petrol to save the loss of millions of pounds, thousands of head of stock and human lives,” replied Cr. Robinson. Crs. McBride and Dore moved that Mr. Giles be advised that steps are being taken now that the National Emergency Regulations have been altered, to deal with fire hazards in the district. ALL GRASS ON ROADS TO BE CUT IN PAKENHAM RIDING At the suggestion of Cr. Bourke, the engineer was given power to purchase a mower—if he is satisfied it can do the job—for the Pakenham riding, to enable grass on roads in the riding to be cut to remove fire risks. The secretary said that the engineer had been in touch with the SR. and WS. Commission and they had a machine with which they cut blackberries, grass and light ti-tree. This was what Cr. Bourke had in mind. John Waterhouse writes in The History of Toomuc Valley Orchards (1878-1950) 2nd ed. "It was a severe tragedy for the [Hume] family when the eldest son, Walter, died at Caversham after fighting the large 1944 bushfires which threatened the house - he lay down on the verandah, exhausted, and suffered a cerebral aneurism." EMERALD.—Two unoccupied houses burnt on Beaconsfield Road 2½ miles out of Emerald. Fire under control last night. Two houses were destroyed by a fire in the Dewhurst district, between Emerald and Upper Beaconsfield, at 4pm yesterday. Chief damage was caused in scrub country, and Emerald and Upper Beaconsfield fire brigades had the fire under control at 7.30pm. AT about 4 p.m. on Monday two houses in the Dewhurst-Upper Beaconsfield area were destroyed by fire. They were owned by Mr. Deeley a former superintendent of the CIB., and Mr. T. Turner, but neither owner was in residence at the time. Chief damage was caused in scrub country, and the Emerald and Upper Beaconsfield fire brigades had the fire under control at 7.30 p.m.
ON BEHALF of the Beaconsfield Bush Fire Brigades’ Group, Cr. D. N. McBride last week took delivery of a Ford V 8 motor truck, practically new, fitted with a hand-operated pump, a 400 gal. tank and capable of carrying 12 men. The Group’s power driven pump is to be affixed to the new fire-fighting unit. W. H. CARNE, secretary of the Upper Beaconsfield and District Bush Fire Brigades’ Group, forwarded a letter from the secretary of the Forests Commission, in which it was stated that the Ford V8 truck. 400 gal. tank and semi-rotary pump loaned to the group until March next was made available on condition that it was as carefully used and maintained—a responsibility which must be undertaken by the municipality. The Commission also asked where the truck is housed. In an emergency the truck can be recalled by the army before March, the letter explained. Cr. Greaves: That means council will be responsible for maintenance, and there may be more than one of these trucks. Cr. Dore considered that there would be no maintenance at all. When Crs. McBride and Anderson moved that the terms of the letter be complied with, Cr. Greaves inquired what right council would have over the truck. For instance, would it go to fires outside the Beaconsfield Group area ? “It’s not supposed to,” replied Cr. McBride, “but we don’t stick to rules and regulations at Upper Beaconsfield. If we’re wanted anywhere, we'll go if we’re asked.” The motion was carried. Cr. Anderson said that next year council would have to get to work pretty early, before the fire season started. AT the request of the Gembrook Bush Fire Brigade, a siren is to be installed at Gembrook to warn members of outbreaks. BREAKING OUT in a gully to the south of Upper Beaconsfield on Friday, December 29, a bush fire, fanned by a strong northerly, extended over 350 acres before it was checked. Some fencing was burnt, but no buildings were destroyed. Bush Fire Brigades from Beaconsfield, Officer and Beaconsfield Upper were quickly on the job and did good work in controlling the fire. A cool change during the night relieved the situation and dispelled fears that the fire would break out afresh the following morning if the north wind continued. Later showers extinguished burning logs and stumps which remained as a possible menace. Bush fires which broke out near Selby township, in the Dandenongs, at 3pm on Wednesday, flared up again in yesterday's heat and north winds, and made headway through dry scrub country towards Clematis on a three-miles front. The fire brigades saved a home at Selby, and four homes - the properties of Messrs Loughlin, Wentland, Atkins, and Madigan on Wellington rd, Clematis, narrowly escaped being burnt. At 5pm Emerald and Clematis brigades, attacking the flames a mile and a half from the Clematis township, with knapsack spray - pumps, appeared to have the fire under control along the natural breaks, when a fresh and more threatening fire suddenly began deep in the scrub behind them. The main blaze joined up with this outbreak and moved rapidly toward Emerald. On the old Narre Warren road flames menaced Mold Bros' poultry farm, containing 2,000 birds, and Mr Stevens' house adjoining, but in each case breaks saved the property. At 10.30 last night fires near Emerald and Clematis were reported to be still burning, but, in the complete absence of wind did not constitute a danger. SUFFERING a stroke following the close proximity of the Emerald bushfire, Mrs. Eva Annie Turner, of Dewhurst (via Upper Beaconsfield), was removed by ambulance to the Dandenong and District Hospital where she passed away on January 11th. The fire, which burnt about 150 acres, was successfully fought by the Upper Beaconsfield and Dewhurst Bush Fire Brigades. The late Mrs. Turner was predeceased by her husband, Mr. Albert Turner, about four years ago. One son, Mr. Henry T. Turner survives her, and we extend sympathy to him in the sudden loss of a devoted mother at the comparatively early age of 61. Although a native of Devonshire, the late Mrs. Turner had resided in Victoria for 32 years, much of this time being spent at Dewhurst where she was highly regarded. Her remains were laid to rest in the family grave in the Church of England portion of the Berwick Cemetery last Saturday. LAST SUNDAY afternoon at about 4 o’clock a fire broke out in grass on Sand Hill at McCormick’s well-known property at Lisbaun, via Clyde. But for prompt action by members of the Clyde, Cranbourne and Officedale Rural Fire Brigades the outbreak would have swept on and done untold damage. As it was it burnt only 30 acres of grass before it swept up to a break which had been burnt along the road to meet it. Towards the end, with local residents rallying strongly to help the brigades, there must have been 300 fighting the, outbreak. One of the fire-fighters, Mr. Fred Heathcote, from the Beaconsfield district, collaused and was taken to the Berwick B.N. Hospital suffering from severe burns and shock. The fire was got under control after about 11 hours strenuous fighting. ON THURSDAY the Dandenong Boy Scouts received the bad news that the buildings at Upper Beaconsfield Camping ground had been destroyed by fire. How and when the fire occurred still remains a mystery, as nobody appears to have seen the blaze. The last time the Troop was up there was on October 19th and the three-roomed building, with its large verandah was then all right, and carefully locked up. A new tank-stand was erected on that occasion but fortunately the new tank had not been put up. Although the building was insured, the insurance does not nearly cover the replacement value, and the Boy Scouts have lost three or four years hard work which went into the building. Now they will have to start again almost from scratch.. THE BEACONSFIELD UPPER Rural Fire Brigade lias been busy lately and some serious outbreaks have been stopped in time. Last Saturday they fought a fire at the back of Mr. Gordon Ayrey’s property, on St. Georges Rd. until midnight. Firemen Left Meeting To Quell Fire! THE Upper Beaconsfield Rural fire Brigade held a very successful meeting on December 5th. The attendance was the best for some time. During the meeting a call came from Miss Elliott for assistance to quell a fire on her property. 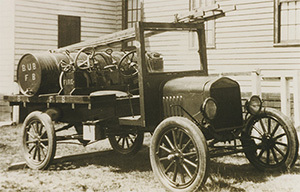 The fire truck, with Mr. Lang and four of the brigade, dashed from the meeting and the fire was out within half an hour of the call being received. Good work, boys! This gives you some idea of the keenness of this volunteer brigade. The Brigade is in need of funds to renew equipment, and the social committee is working hard with its dances to raise funds for this purpose. There is to be a Midnight-To-Dawn Ball on New Year’s Eve; also a Ball on February 9th. Everyone welcome. FIRE BRIGADE HAS TWO CALLS OVER THE weekend the Upper Beaconsfield Fire Brigade has been very active. It was called out on both Saturday and Sunday, merely because people had lit fires but had not put them out. On both days houses in St. Georges Rd. were endangered by this carelessness. The brigade intends to be very strict on such offenders after the proclamation is made known, because the members of this voluntary brigade do not wish to spend their leisure hours fighting fires that should never have started. A MIDNIGHT TILL DAWN ball will be held in aid of the Fire Brigade on New Year’s Eve. Several private garages and sheds and farm and Crown properties were destroyed when a smouldering fire revived at 10.10 last night at Upper Beaconsfield. Late last night about 100 volunteer firemen, hastily summoned, and district brigades were co-operating in efforts to quell the blaze. THE PRESIDENT and members of the Beaconsfield Upper Rural Fire Brigade desire to convey their sincere thanks to all members of neighboring brigades and others, who so promptly came to then help on Friday, February 16th, when the township of Beaconsfield Upper was seriously threatened by fire. -Signed, D. J. FULLERTON, hon, secretary. AN S.O.S. TO ALL DISTRICT RURAL FIRE BRIGADES was ... out by Upper Beaconsfield last Friday night when the township was threatened by a bush-fire, which, whipped up by a strong north wind swept down on a number of houses, endangering both lives and property. 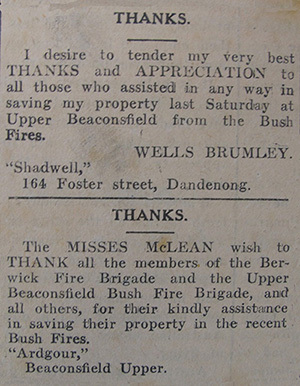 Only the strenuous efforts of some 200 fire-fighters saved a number of houses in the town, and although some sheds and outbuildings were lost, the damage would have been much more serious but for the ready response to the Upper Beaconsfield Rural Fire Brigade's Appeal for reinforcement. The fire, which is believed to have broken out in the Stony Creek area at about 8 p.m. on Friday, swept towards the township, threatening homes in St. Georges Rd. Only the prompt action of members of the local Rural Fire Brigade, assisted by members of neighbouring brigades and other helpers, saved homes in the area from being destroyed, including "Runnymede” Guest House. The brigade put up a strong fight to save Mr. W. Noblet’s house, and fortunately only one small outbuilding was lost. Crossing the road to Mr. Funnell’s property, the brigade again saved any serious damage. One of the biggest losses was sustained by Mr. Kilvington, where the fire destroyed some outbuildings, one of which contained a large stock of poultry food. Another home which was in danger for a time was that owned by Mr Begg. The brigade, which was under Dave McDonald, assisted by a number of voluntary helpers, carried out a magnificent job, and all are ... commended on their good work. The opinion was expressed ... ible, and also for providing firebreaks last year prevented the destruction of property in the township area. The brigade had the fire under control by evening and members ... led the area throughout the night. Later a fire broke out at Mr O’Keefe’s property and was brought under control. The thanks of all concerned ... tended to the members of neighbouring brigades who assisted in ... ling the outbreak, also to the postmaster, Mr. Murtagh, for his assistance with telephoning, and ... of the S.E.C. staff for their ... action in assisting the brigade. Special thanks is extended to the womenfolk of the district who stood by and assisted wherever possible, and also for providing ... refreshments throughout a very trying time. During the height of the ... on Friday afternoon a call was received to the home of Mr. Watson, "Linden Park", where a stove had set the house on fire. Assistance was sent promptly. The brigade saved four rooms of the house. AT MONDAY'S meeting of Berwick Council Cr. C. Harris ... people of Upper Beaconsfield were grateful to the neighboring brigades and all who had rallied to their ... was a dangerous fire and although homes were saved one man ... over £1,000 worth in one shed. IN THE report of the Upper Beaconsfield fires forwarded to us and published in our last isue, a kerosene stove was blamed for the fire which partly destroyed Mr. G. M. Watson's home. We have since been informed by Mr. Watson that there was no kerosene stove in his home—and, in fact, no fire alight in the house at all. He was away in Dandenong, where he recently purchased a home, and his son Jack had answered a call to help fight the bush fire which at that time was threatening Kilvington’s home. Mrs. Watson, who was home on her own, had not been well and was resting. She noticed the smoke but thought it was from the bush-fire from across the road. When finally she became alarmed and investigated it was to find that the back corner of the house was blazing. She threw water on the flames from the inside and rang for assistance. Members of the Rural Fire Brigade and others fought the flames and succeeded in saving the front portion of the home and its contents, which were removed. But two rooms, a sleep-out and two verandahs were destroyed, together with their contents, which included many boxes of linen and other household equipment which had been packed ready for removal to Dandenong. There was no fire-place in the section of the building which was destroyed, and it can only be surmised that the outbreak was started by a spark from the bushfire. Mr. Watson's loss was partly covered by insurance, but he will still be a heavy loser. THOSE district residents who remember last year’s destructive fires will need no urging to go along to the annual meeting of the Upper Beaconsfield Rural Fire Brigade in the Assembly Hall on Thursday, September 27th, at 8 p.m., to help get ready to meet any similar dangers in the coming summer. ONE OF the most successful meetings in the history of the Upper Beaccnsfield Rural Fire Brigade was held in the Assembly Hall on September 27th. The ante-room was packed and keen interest was shown in the affairs of the brigade by everyone present. Apologies were received from over a dozen who were unable to attend owing to illness. Major-General Morris, who has not been enjoying the best of health recently, vacated the presidency and his position was filled by the genial and popular Mr. T. B. Guest. Mr. David McDonald, captain of the Brigade, was unable to be present owing to ill-health and tendered his resignation as captain. The new captain is Mr. Bill Knapton, and the older members were delighted to see one of the younger brigade fill this important and responsible position. Another newcomer to the ranks of the executive officials is Mr. Keith Gibbs, who became 4th lieutenant. The remaining posts on the executive of the Brigade were retained by last year’s officers. An address by Mr. Purdy, the Regional Officer, on matters of interest to fire brigades was received with much attention. Mr. Guest closed the meeting by thanking all present for their attendance and for the honor they had tendered him in asking him to be president. Hundreds of fire fighters last night fought scrub fires in the Dandenongs. Main outbreaks were near Emerald, Cockatoo, Beaconsfield, Dewhurst. Avonsleigh and Macclesfield. All were under control late last night. Emerald residents fighting a bushfire spreading on a two-mile front last night want to catch the "man with the candles." They say stumps of candles have been found in several parts of the district where small fires have occurred recently. Late last night gangs of rural fire fighters assisted by volunteers were still fighting a fire that had burned large patches of scrub and grazing land along the old Narrewarren and Beaconsfield roads for a distance of more than four miles. The fire broke out soon after 1 p.m. in front of Mr. Douglas Neeson's property, Lavender Farm, and the flames, fanned by a strong westerly breeze, quickly spread. When the alarm was given to the Emerald rural fire brigade the township was drowsing in the fierce heat of the early afternoon. Then the siren was sounded, and within minutes the township was virtually deserted as all the available men hurried by car and truck to fight the blaze. Another fire started on Mr. C. Rowse's property on Beaconsfield road, about the same time. Calls for help were sent to surrounding districts and members of the Clematis, Menzies Creek, Upwey, South Belgrave, and Narrewarren brigades answered. More than 200 fighters battled with the blaze all afternoon, and at 8 p.m. the Emerald siren sounded again calling for reinforcements. The chopping wind blew the fire down a heavily-wooded valley between the Old Narrewarren and Beaconsfield roads, and danger threatened near what is known as the Sandy Crossing in Kardinia Creek Valley. The menfolk of Emerald worked overtime preparing sandwiches and gallons of tea for the weary men. Some of them had been fighting the blaze for seven hours without a break. Even then they did not want to come out of the danger zone because they feared that if the blaze flared again it would endanger several homes.